+ Describing what you used to do. 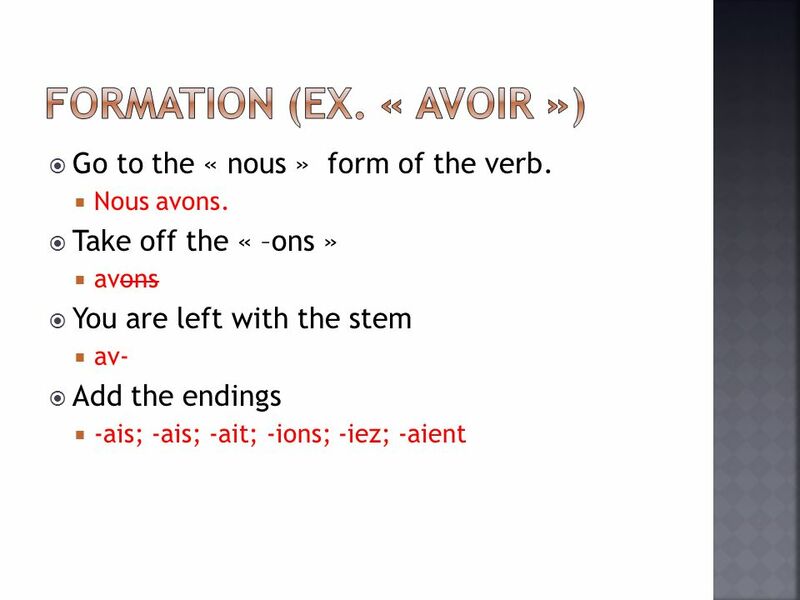 Go to the « nous » form of the verb. Nous avons. Take off the « –ons » avons You are left with the stem av- Add the. 6 To describe… What was happening, used to happen, or happened repeatedly in the past. Les enfants jouaient. Jhabitais à Paris. Elle lisait un livre chaque jour. Translates as : was + verb + ing / used to. To describe people, things, or conditions in the past. Il était beau.Il faisait froid. Il avait malade. La fenêtre était ouverte. 7 To express the day, month, and year in the past. Cétait samedi. Cétait le mois de juin. Il était neuf heurs. To express a situation or circumstance that was going on when a single action or even occured. Je regardais la télé quand le téléphone à sonne. 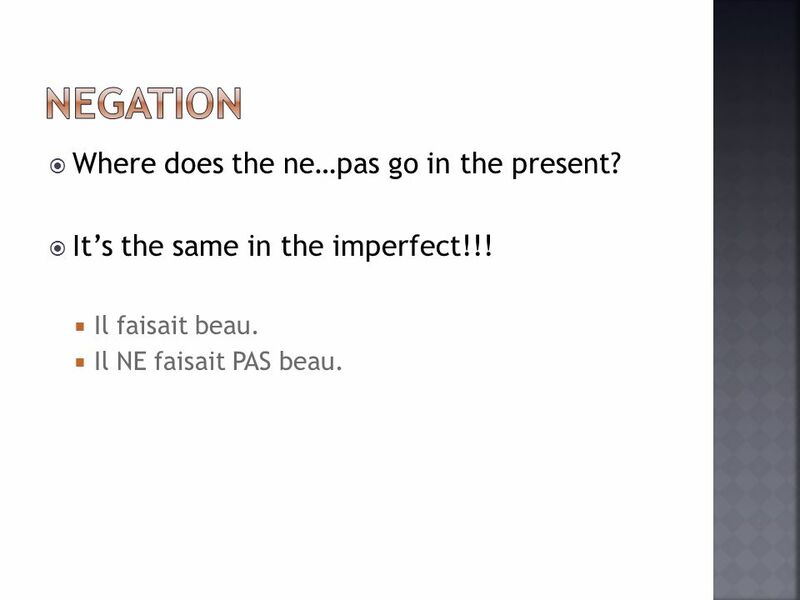 8 Where does the ne…pas go in the present? Its the same in the imperfect!!! Il faisait beau. Il NE faisait PAS beau. 10 ç is added in the boot in front of the letter « «i » (je/tu/il/elle/ils/elles). AVANCER Javançais Nous avancions Tu avançaisVous avanciez Il/elle avançaitIls/elles avançaient. THIS IS TO AVOID THE HARD K SOUND! Télécharger ppt "+ Describing what you used to do. 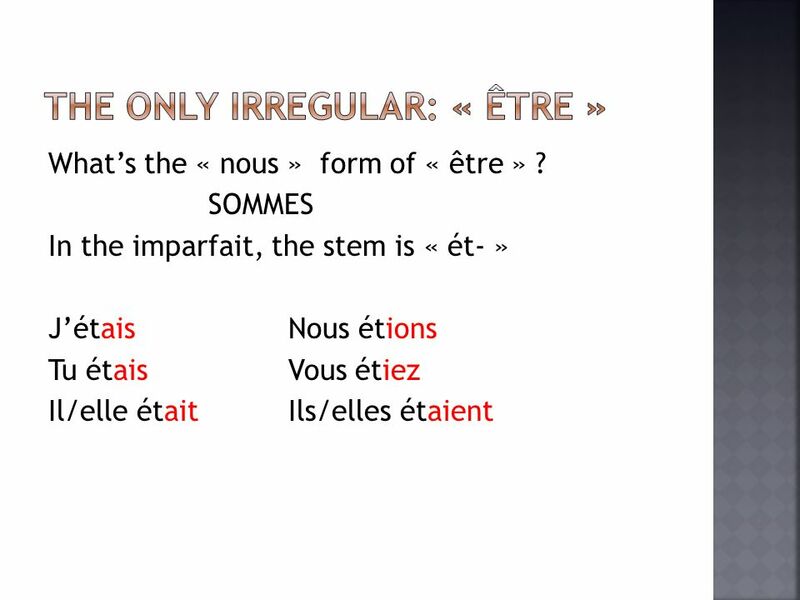 Go to the « nous » form of the verb. Nous avons. Take off the « –ons » avons You are left with the stem av- Add the." 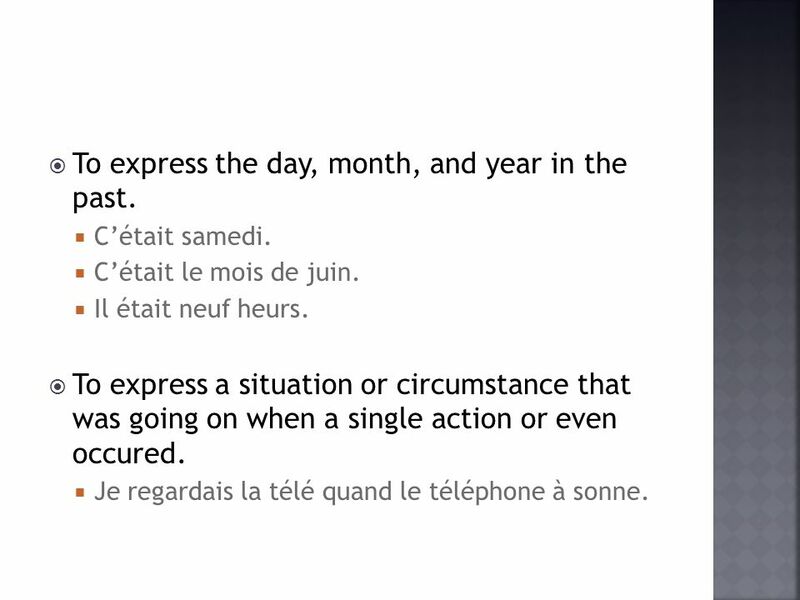 The basics Passe Compose expresses specific actions or events that were started and completed at a definite point in the past EX: Jai fait mon lit ce matin. RAPPEL! 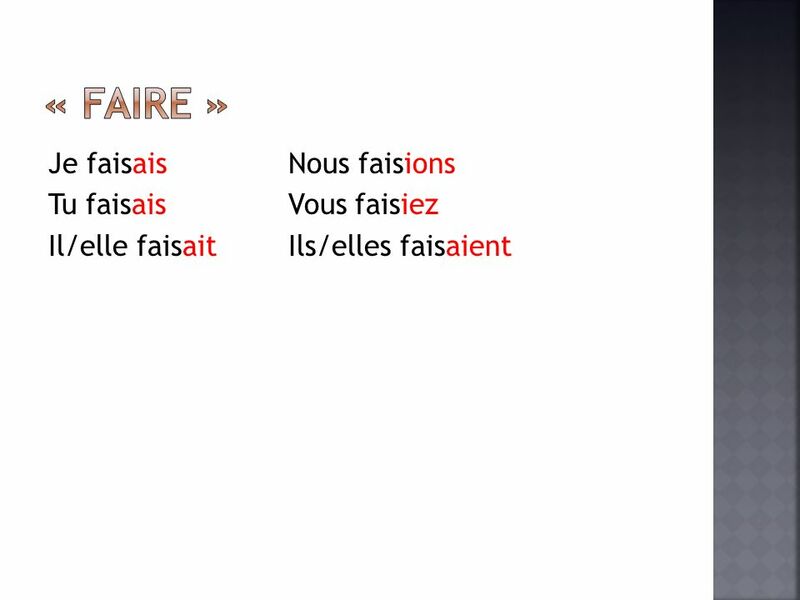 Le Passé Composé Le passé composé is used to express actions that are completed in the past. An idea expressed in the passé composé can be translated. Français Deux Limparfait. You have only learned one past tense in French, Limparfait is another one. Le Conditionnel Rouge Unité 8. 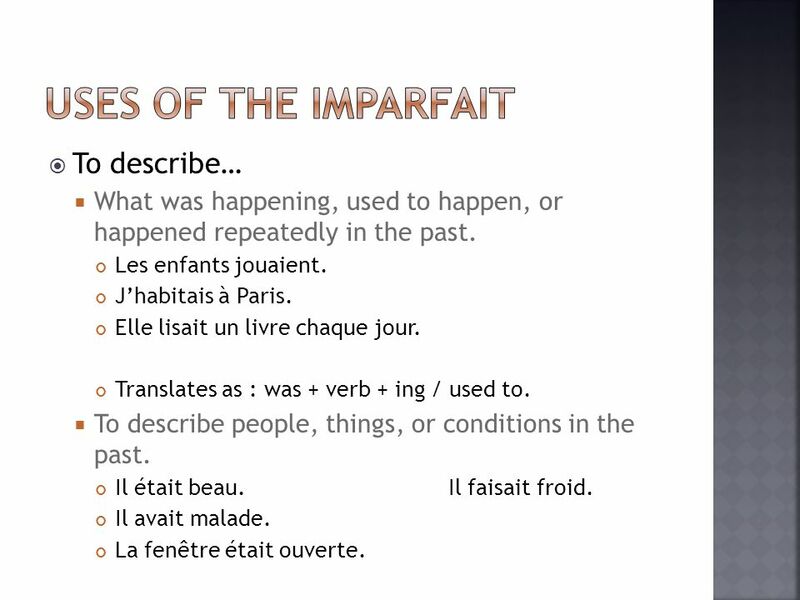 I would… The conditionnel is used to describe what would happen It is formed with the imparfait endings. 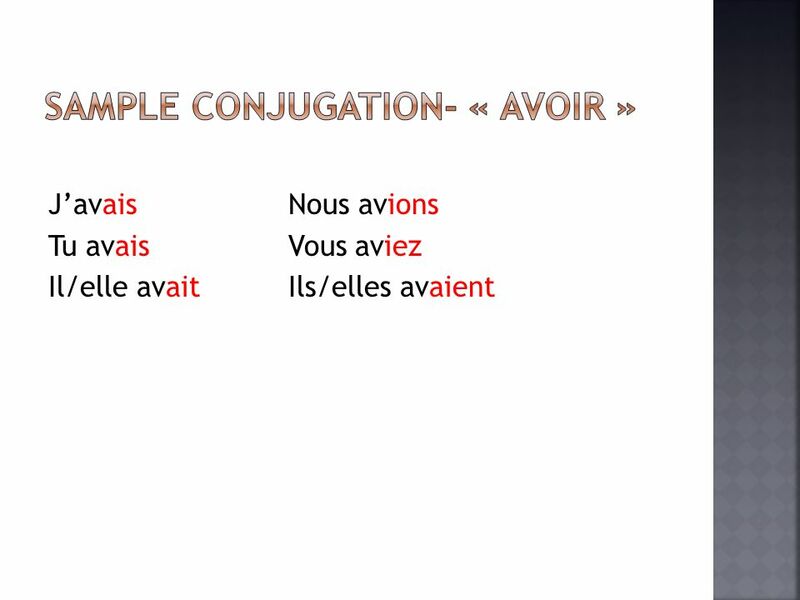 AVOIR: Present Jai I have Nous avons We have Tu as You have Vous avez You have Il/Elle/On a He/she/we have Ils/Elles ont They have. 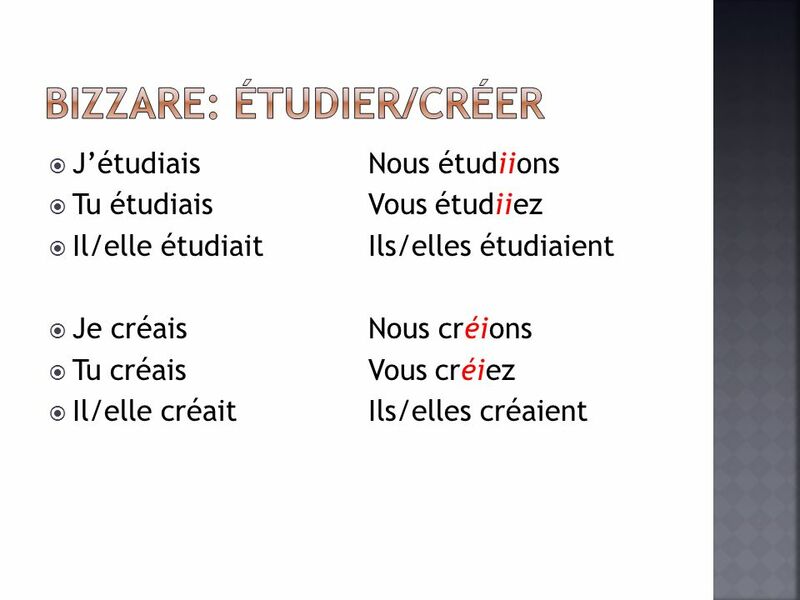 Jeudi, le 10 octobre Objectif de la leçon: To be able to form and detect the Imperfect Tense in French. e.g. I used to buy/ I was buying Olympics values. 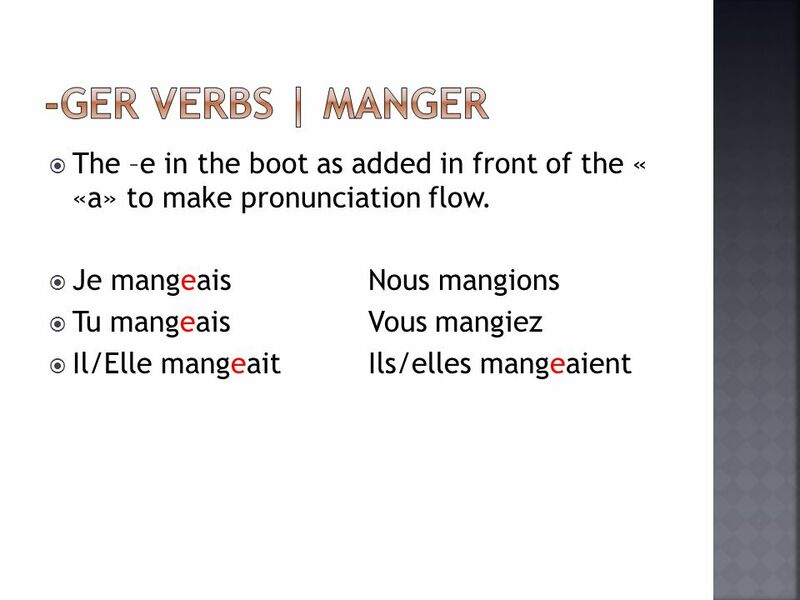 Limparfait Narrating in the past Formation: Same for all endings (ER, IR, RE) Find the stem: drop the -ons ending from the nous form in the present tense. 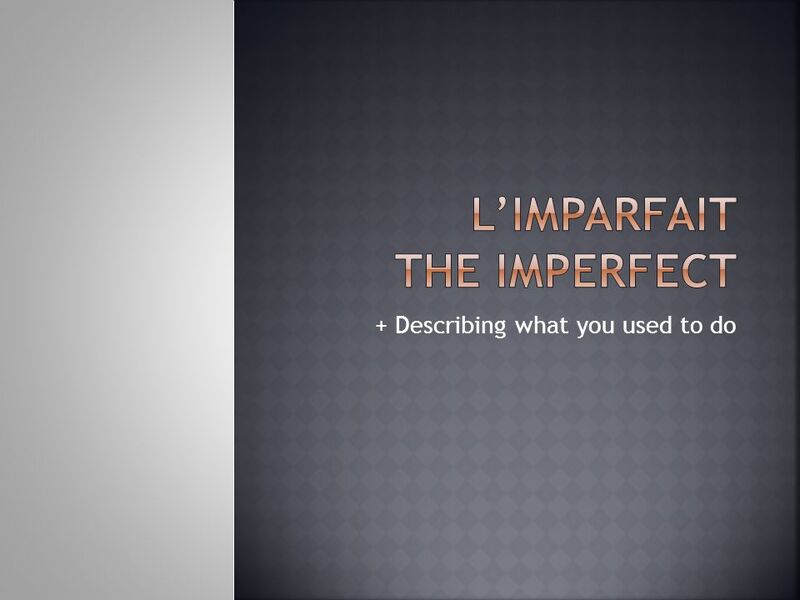 LIMPARFAIT = THE IMPERFECT TENSE. DESCRIBING THE PAST. 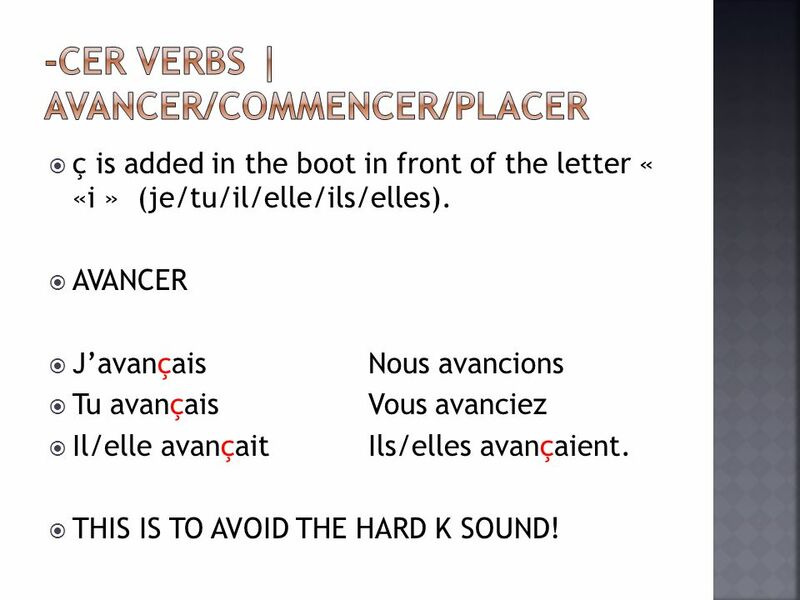 Avoir or Etre (present tense) + Past participle Nous form present tense Minus ONS + AIS,AIS,AIT,IONS,IEZ,AIENT Have verbed, verbed, did verb Specific action,what. Limparfait The imperfect The Other Past Tense Forms.